Besides its direct work with children in the classroom, Agape Mission has taken on an important role in providing their material needs. The orphans are frequently without even the base necessities: personal hygiene products, underwear, and school supplies, not to mention toys. We strive to provide each child personally what he or she needs. We send shoes and clothes, school supplies and hygiene products. Agape provides the orphans everything they need for school: clay, markers, and colored pencils. At each lesson the children receive a cookie and candy. Besides this, each orphan in the orphanage receives a gift on his or her birthday, at Christmas, and at Easter. Without the care of Christians, these orphans would never see any of this. The result of these efforts is that these orphans open up, become kinder and gentler, begin to trust adults and – what is most important – they find a Heavenly Father. 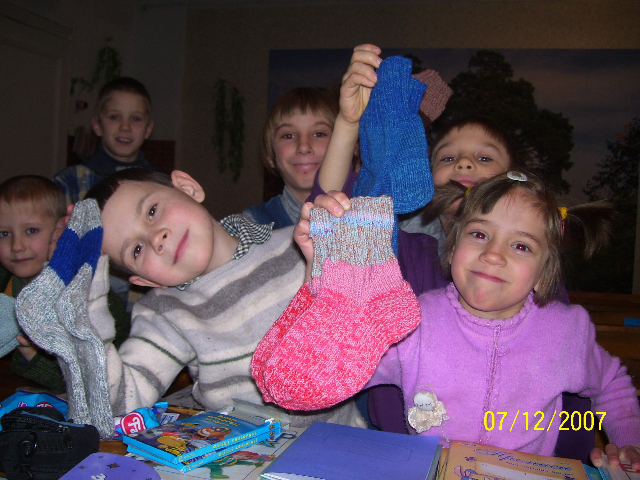 We work with about 4000 orphans in more than 30 Ukrainian orphanages. It's hard for us to provide each orphan with things he or she needs. Dear friends – orphans need your help today! We guarantee: everything you send will go directly to the orphans!